Clinical History: A 15 year-old male was injured 11 days ago performing a long jump. Coronal (1A) and sagittal (1B) fat-suppressed proton density-weighted images are provided. What are the findings? What is your diagnosis? Coronal (2A) and sagittal (2B) fat-suppressed proton density-weighted images of the knee reveal high signal intensity at the mid to lateral growth plate (arrowheads) with a triangular fracture of the medial metaphysis (arrow), indicating a Salter-Harris type 2 fracture. The periosteum has been stripped from the metaphysis of the lateral femur (blue arrowheads). Posteriorly the periosteum is torn and displaced into the fracture at the growth plate (small arrows). Salter-Harris 2 fracture of the distal femur with trapped periosteum. The Salter-Harris 1 (SH 1) fracture extends through the growth plate, leaving the resting and dividing cell layers attached to the epiphysis. The fracture is not always perfectly transverse but can undulate so that microscopic involvement of the metaphysis can occur. This is more common as the child ages. A larger ossification center increases the likelihood of metaphyseal involvement. Displacement is frequently prevented by an intact periosteal attachment into the zone of Ranvier, the region responsible for peripheral growth of the physis.3 Type 1 injuries are more common in patients under the age of 5 with the exception of the proximal humerus where the peak age is 10-12 (little league shoulder)(fig 5). Apophyseal injuries are a form of Type 1 injury.1 Subclass 1B occurs in children with systemic disorders affecting endochondral ossification in the metaphysis (myeloproliferative, thalassemia or neuromuscular sensory disorders) so that the fracture passes through the zones of degenerating cartilage and primary spongiosa. Subsequent growth is generally normal in types 1A and B, as the germinal layer responsible for epiphyseal growth remain intact. An exception can occur in the proximal femur if the major blood supply to the epiphysis is disrupted which can lead to osteonecrosis, premature physeal closure and severe growth deformity. A fat-suppressed T2-weighted coronal image of a SH 1 fracture through the distal femoral physis demonstrating increased signal intensity (arrowheads) in the growth plate relative to the tibial growth plate. The distal fibula is a common site for a SH 1 fracture. Coronal proton density-weighted with fat-suppression (4A) and axial T2-weighted (4B) images demonstrate elevation of the periosteum, which helps confirm the diagnosis. Widening and abnormal signal intensity across the growth plate of the proximal humerus, indicating little league shoulder, a variation of a SH 1 fracture. SH 2 of the distal femur with the Thurston Holland fragment (asterisk) created by a vertical metaphyseal fracture (large arrows) and a horizontal fracture through the physeal plate (small arrows). A tear of the periosteum (arrowhead) is present along the distraction side. Sagittal MR image of the knee demonstrates a SH 2 fracture of the proximal tibia with displacement due to traction on the tibial tuberosity (asterisk). The physeal component (arrow) and the Thurston Holland fragment (arrowhead) are indicated. Coronal and axial CT and MR images of the ankle (different patients) demonstrate a Tillaux fracture with a sagittally oriented fracture through the epiphysis of the distal tibia (small arrow) and the axial fracture through the growth plate (large arrows). The displaced epiphyseal component (asterisk) is readily apparent. The coronal CT image demonstrates the fusing growth plate which is typical for this fracture. 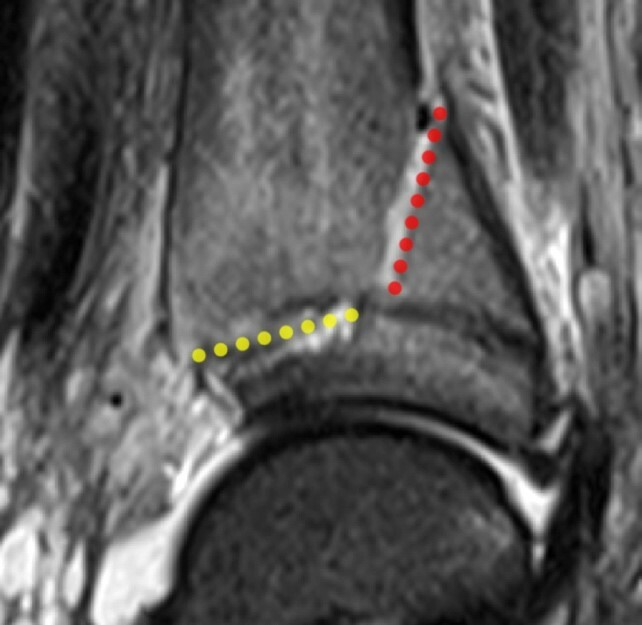 Coronal fluid-sensitive MR image of the knee shows a SH 3 fracture with a sagittal fracture of the epiphysis (small arrow) and axial fracture of the growth plate (larger arrows). Mild angulation results in incongruity of the articular surface. The periosteum is elevated by hematoma (red asterisk). Sagittal, coronal and axial CT (10 A, B and C) and coronal and sagittal MR (10 D and E) images of the ankle demonstrate a SH 4 fracture of the triplane type. A coronal fracture extends through the posterior metaphysis of the distal tibia (red line) with a horizontal fracture through the lateral growth plate (yellow line) and a sagittal fracture through the epiphysis (blue line). Subperiosteal hemorrhage is present (red asterisk). Sagittal T1-weighted MR image of the ankle demonstrates formation of a bony bar (arrowheads) across the growth plate 2 years after a SH 1 fracture. A T2-weighted axial (long axis) view of the base of the 1st metatarsal reveals a growth disturbance (arrowhead) from a remote physeal injury. Coronal fat-suppressed proton density-weighted (A) and sagittal T1-weighted (B) images and corresponding AP radiographs (C) of the knee show a chronic growth plate injury with mild growth disturbance (arrowheads). Treatment options for growth arrest include physeal bar resection, epiphysiodesis, chondrodiastasis and limb lengthening and deformity correction. Epiphysiodesis is used for a bony bar affecting greater than 50% of the physis. A fat-suppressed proton density-weighted coronal MR image of the knee reveals the periosteum torn and stripped from the femoral metaphysis and entrapped (arrowhead) in a SH 1 fracture. Coronal fat-suppressed T2-weighted MR image demonstrating entrapment of the distal end of the torn tibial collateral ligament (arrowhead) in a SH 3 fracture of the proximal tibia. Childhood fractures can frequently involve growth centers and are thus at risk for growth disturbances. Such fractures are commonly described using the Salter-Harris classification system. Most of the fractures will heal without complications but surgery may be needed to restore articular surface congruency or remove interposed soft tissue structures which could delay healing or cause premature fusion. In cases, where growth plate disturbances arise, MR provides critical guidance in the detection of disturbances and in the evaluation of the severity of growth arrest.